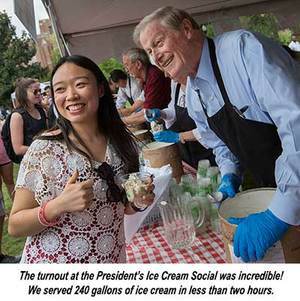 It’s been a fantastic spring semester for Florida State University, and you're a big reason why. You are receiving prestgious awards and elevating the university's level of national prominence through research and leadership. I applaud the entire faculty for your efforts to make Florida State a better place to learn and work every day. There are too many examples around campus to talk about in this letter, but I’d like to mention a few. In early March, Professor Hengli Tang from our Department of Biological Science and researchers from Johns Hopkins University and Emory University published one of the first major studies on the Zika virus that showed a link between the virus and microcephaly. Last week, the Centers for Disease Control confirmed their findings. Hundreds of media outlets worldwide covered FSU’s groundbreaking news. This is a great example of research in action — and one that U.S. Rep. Gwen Graham acknowledged as she called on Congress to increase funding for Zika research and prevention on April 12. The College of Criminology and Criminal Justice faculty was ranked No. 1 in the nation — again! — for producing articles published in top criminology journals according to a recent study. This is a very deserving recognition of their prolific research in the field. The Department of English received lots of good news in recent weeks. Professor David Kirby was honored by the Florida Humanities Council at the Governor’s Mansion with the Florida Lifetime Achievement Award for Writing, while Professor James Kimbrell received a Guggenheim Fellowship. Kudos to them both. 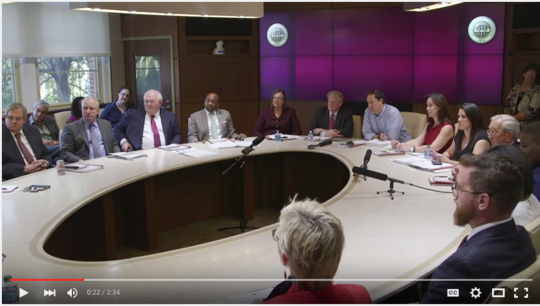 And speaking of the Legislature, it was my pleasure to welcome Florida Senate President-Designate Joe Negron to Florida State on April 18 during his State University System Listening Tour, along with his fellow senators Lizbeth Benacquisto, Oscar Braynon, Anitere Flores and Bill Montford. Sen. Negron has said that improving the SUS is one of his top priorities during his two-year term as Senate president. We were thrilled to show off some of our top programs, students and faculty. 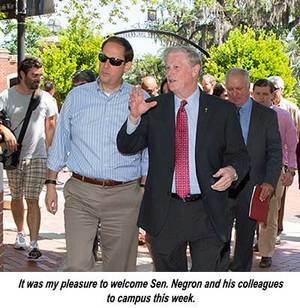 I’m confident the senator will be a strong advocate for FSU and higher education during his term. Thank you to everyone who made donations to worthy projects during FSU’s Great Give! The event raised more than $206,000 in 36 hours — a very nice addition to the Raise the Torch campaign, which totaled $882.8 million through February. As the semester comes to a close, I also want to thank all of you for your dedication in making Florida State a great university. In a few days, more than 6,000 of our students will be graduating. I want you all to take the time to celebrate their achievements as well — because they couldn’t have done it without you. As always, I invite you to share your ideas with me and keep me posted on all the exciting news throughout campus.